My maps aren't as pretty as bluntsword's but they're more for me than for you, I just like sharing. Herein find the Kingdom of Dach, divided in to the holdings of its highest lords. The kingdom is currently in the throes of civil war (pls ask me about my warz). In the south of this map is the Seals, which is a part of the Kingdom of Arlond, the rest of which is further to the south. This is a geopolitical map, where the colours indicate owner and not terrain. Each town/city/keep has a name. I'll post the map both with and without the names because, geez, it gets cluttered. 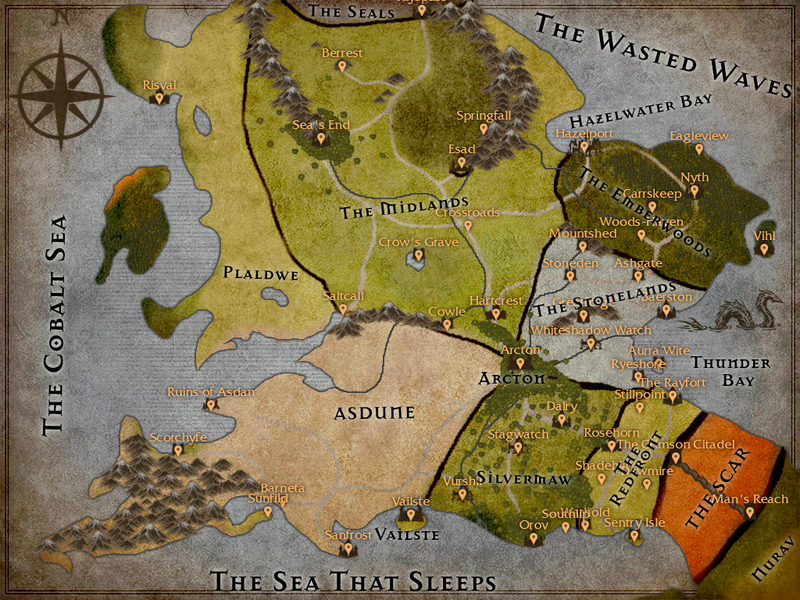 Herein find the rest of the Kingdom of Arlond (and ignore how much it looks like England, we're working on that). 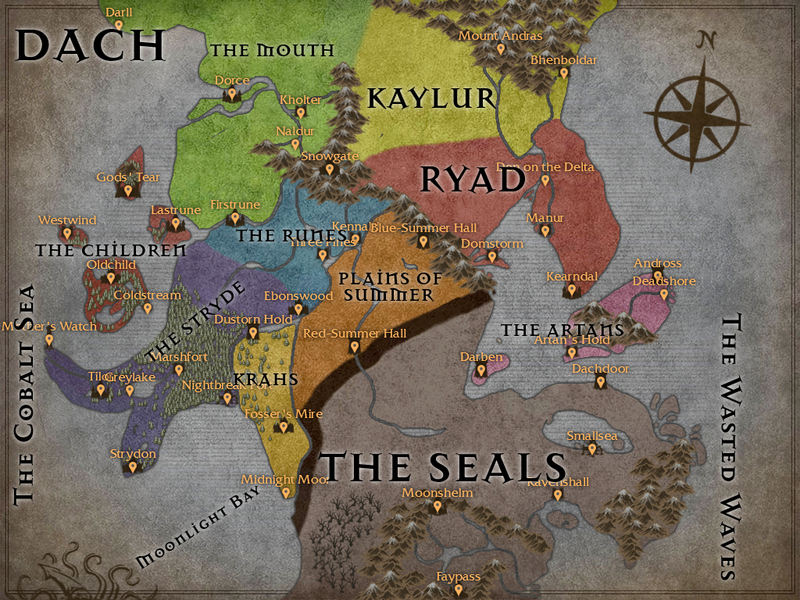 This is a kind of geopolitical map where colour indicates terrain and borders indicate owner, although the entirety of Arlond is under one crown. Please ask me questions about the world and give me critiques on the maps! I'm very excited to be working on this world - a group of friends has asked to play some dungeons and dragons in it, and that would just be awesome. What kind of day cycle do they have? Are days/months/years different than we're used to? Days, nights and years are on a similar scale to Earth's. However, the planet orbits a binary system, the two suns being a very important part of most cultures' outlook on the world, especially when it comes to worship systems and religion. Due to the binary system and a slightly eccentric orbit, there is a sort of meta-yearly climate cycle over a period of around a decade, i.e. : the year 190 is the warmest year of the cycle, the year known (in Arlond, at least) as the great solstice, as is 200, 210, etc. the year 195, 205, and so on, are the coldest years of the cycle. Seasons occur annually as they do on Earth, but they are influenced heavily by this cycle. The planet has one large-ish moon, probably similar in scale to our moon. It takes slightly longer to orbit the planet than our moon, and its orbit is more eccentric and irregular than ours, so months aren't really something that work out. Instead, years are simply divided in to seasons in most cultures. The north pole lies on land, in the frozen wastes north of the mountain range in the north of Dach. South of Arlond is a peninsula of the continent called Felis, where the Illeli and Darin live. South of there has been explored very little, but it is widely believed that the south pole does not lie on land. The waters west of Arlond have also not been explored. The only series I can think of is the Necroscope series. He wrote a lot of interesting things about the planet's seasons and climate. It's weird week long nights and month long days.